Multiple Sclerosis is a condition that results from the deterioration of the insulation – called the myelin sheath – that insulates and protects the nerves that make up nervous communication system. In this disorder, the myelin sheath is attacked by the immune system cells, causing which cause degeneration of nerves and muscular dysfunction. It is not too hard to see that this condition amounts to a bad connection in afflicted areas. Inflammation is a root cause in most neurodegenerative diseases – Alzheimer’s disease, Parkinson’s & MS. Medical Cannabis is used to treat these kinds of disorders due to its powerful anti-inflammatory properties. In this inflammatory process gone wrong, the insulation material ( called Myelin) that wraps around the nerve fibers becomes compromised – the nerves are directly exposed to damage by microbes, toxins, and rogue immune killer cells. A defect in metabolism that affects Myelin production is also a factor in MS. Myelin is a fat-protein composite material. A deficiency in amino acids, phospholipids and trace minerals can be a complicating factor in MS.
Cannabinoids like THC and CBD – found in large quantities of certain strains of Medical Marijuana – have proven to be highly effective in managing many of the symptoms MS. Oromucosal (mouth) sprays like Sativex (R) have been approved as adjunctive treatment for neuropathic pain in Canada. Other medicines, used in combination with cannabinoid medicines are also being tested to help MS patients cope with disabling spasticity. Partial or complete loss of vision with pain in one eye. 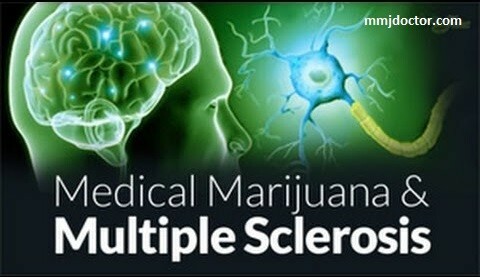 MMJ DOCTOR: How can Multiple Sclerosis patients get legal access to Medical Marijuana for the first time? Click here to get an appointment with a licensed California Doctor today. We strongly advise new MMJ patients to check out our Health and News section for hand-picked expert information about Medical Marijuana in California, user’s guide, medical articles, and more.